In order to get answers to basic questions all around algae in the aquarium, we recommend you read this article first. Hair algae are quite commonly found green algae. They form coats, from which densely packed short filaments grow. They form carpet-like layers, growing over plants and decoration. These algae usually belong to the genus Oedogonium. The species in this genus differ by the length and build of their filaments. Hair algae with longer, soft filaments are frequently found in aquaria. In this picture, several algae species can be seen. The hair algae coat on the leaf of the red plant is clearly visible. Like many green algae, hair algae appear mainly during the cycling phase of a tank, when the biological system is still finding its balance. After some more time, when the nutrients are optimally balanced and when a sufficient number of algae-eating aquarium animals is present, hair algae will disappear all by themselves. 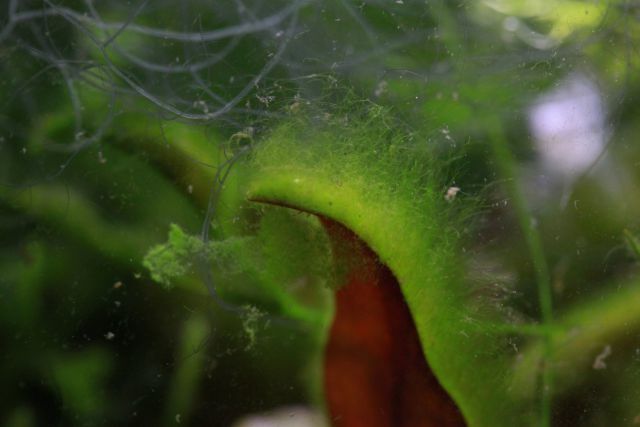 Algae with softer filaments are eaten by invertebrates like Amano shrimp and most dwarf shrimp species. Even snails like the highly popular ramshorn snails will go after the filamentous hair algae coats. There is one species with short, hard, bristle-like filaments (see photo), which is not commonly found but very stubborn. 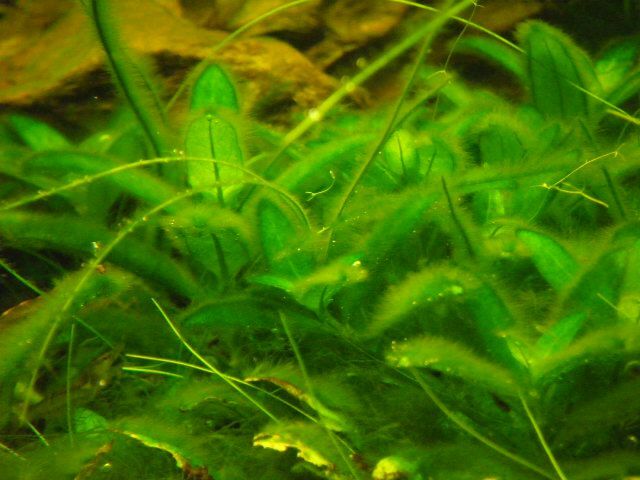 The water plants are suffocated by the fast growth and the dense growth habit of this short-filamented hair algae species. Like green thread algae, hair algae can appear due to a nutrient imbalance, for example when some nutrients or CO2 are deficient. However, overly long lighting hours or too intense a light above the tank can be a reason for their occurrence. It is important to give the algae lots of competition on the form of a large number of fast-growing aquarium plants. For them to grow healthily and happily, a balanced supply of nutrients is vital, especially when it comes to macronutrients (NPK). In the following you'll find a list of these nutritive elements and the recommended content in the water. Using a CO2 injection system in combination with liquid fertilisers facilitates supplying your aquatic plants with everything they need very much. The content of dissolved CO2 in the aquarium water is best monitored with a permanent test filled with test agent. Renew the test agent every four to six weeks so your permanent test always works reliably. The ideal concentration of CO2 is at around 20 to 30 mg/l, which is indicated by the color green inside the permanent test. If the light is too strong in relation to the requirements of the plants and the nutrient supply, hair algae may occur. When you switch to another light system or leave on your light for a longer time, always adapt your plant mass and your fertilisation regime. It is very important that the light requirements of the aquatic plants are in accordance with the lighting system. Most nurseries have a traffic light system to categorize their plants (green - undemanding, yellow - moderate, red - demanding). This is also a hint towards how much light a plant needs. Moreover, we recommend keeping the daily lighting period in a newly set-up tank rather short, like only 6 hours, in the early stages. Increase by 30 minutes every week. If your light has a moderate to strong output, leave it on for a maximum of 10 hours per day. Tanks with weak light can be lit for up to 12 hours. You don't know just how strong your aquarium light is? Find out with our light calculator. Often stunted growth in aquatic plants is due to a lack of nitrogen. This can be diagnosed by testing the water with the appropriate water test for nitrate. When the plants stop growing, especially green algae soon take advantage of this situation and use the nutrient imbalance to take over the tank. With good liquid fertilisers like for example Aqua Rebell Makro Spezial N or Advanced GH Boost N you can boost the nitrate (NO3) content in a targeted way. Other macronutrients like potassium or phosphate are not added by these fertilisers. If there is a lack of nitrate in your tank you can raise the content to the optimal level by a one-time stock fertilisation with Advanced GH Boost N. Combined with this measure you ought to adjust your regular fertilisation regime, be it weekly or daily, with a nitrate-only fertiliser. Nutrient imbalances are often caused by a slack-off in maintenance. Please note: a regular water change is vital! Exchange at least 50% of the aquarium water for fresh water once a week. Besides the addition of fresh, unpolluted water a regular water change prevents certain nutrients from building up in your tank. As we've already said above: The typical countermeasures that are used against green algae in general also help against hair algae: the use of a sufficient number of algae eaters (for example Amano shrimp) hand in hand with an optimization of the fertiliser regimen, especially in the area of macronutrients (NPK). Is your tank still cycling? Then stay calm, it is absolutely normal that algae appear during this phase. When your aquarium has been running for a longer time, the ecosystem will become more and more stable, and the water plants will be able to outcompete the algae. If only a few leaves are infested, just cut them off and throw them away. If the hair algae only grow in a few spots in your tank, try fogging them, preferably with hydrogen peroxide or in combination with Easy Carbo (Please note: do not mix these products, but use at different times). Easy Carbo as a single ingredient is not always efficient enough in the case of hair algae. Is your tank more heavily infested with hair algae? Try a black-out treatment to get rid of them. As a last resort, in the case of major infestation or if your hair algae belong to a particularly stubborn species, treating the tank with algicides like Algexit or a complete treatment with hydrogen peroxide have proven successful. Technical equipment like the Twinstar or a UVC purifying unit can impede the reproduction of hair algae as they kill off the algae spores floating in the water.